"Mo" Diamonds are virtually indistinguishable from Natural Diamonds. Moissanite delivers more Fire and Brilliance (that can be measured) than Natural Diamonds. Many people who have decided to dump fiat money (in the current currency crack-up) in favour of investing in gold antique jewelry would also like to know more about the transparent white stones in their antique gold work collection. They can be assured of the gold content by the hallmarks guarantee of quality but are those clear white stones the real thing or not? Questions may come up in your mind too when you see an unusually large diamond in a manufactured diamond engagement ring. Uhmmm...is that a genuine Diamond or a 'me-too' Diamond substitute? Well, one thing's for certain, it is no Persian Gulf Pearl! Facts about Diamonds places Moissanite at 9.25 (we are not talking sterling here) on the Mohs Scale of hardness, ranking it harder than Rubies, Sapphires and Emeralds. Not only does "Mo" win on strength, but Moissanite possesses more fire (0.104) and brilliance (2.65-2.69) than diamond gemstones (0.044 and 2.42 respectively)! That is one powerful call. And if it's good enough for Hollywood couples, famous actresses, and couples in love, then Moissanite diamond Jewelry and designing your engagement ring from Antique Jewelry, for less than it costs to buy a "new" diamond ring, might be the answer for you too. After they had come onto the market, many of the professionals were wondering if these Me Too diamonds might cause the diamond industry even to collapse! They are good impostors; not your average diamond imposter, this gal's best friend out fires the real thing. The synthetic was so identical to the natural diamond it forced the jewellery market into quick action; they had to come up with a method to identify synthetic Moissanite diamonds. Or a real risk existed that synthetic Moissanite could negatively affect the diamond industry. It didn't turn out to be that hard to identify to the great relief of the diamond industry. With a trained gemologist's eye you can identify lab created diamonds with a 10x Jewelers Loupe! Not a gemologist? Get yourself a good diamond Moissanite tester and read-up on the Facts about Real Diamonds compared to the Mossianite Diamond Facts Below. Moissanite is a silicone carbide first discovered in a meteorite in 1893 by Henry Moissan, a French chemist. Contrary to what many people think, Moissanite did not originate in a scientist's laboratory. Because of a limited supply however of naturally occurring silicone carbide, a laboratory in North Carolina realized the opportunity and produced a simulated lab created diamond version of naturally occurring silicone carbide. In 1995, jewelers realized its potential as alternatives to diamond rings. The crystals are made with silicon and carbon through a combination of pressure and heat in the laboratory. Moissanite was created to look, feel and reflect light just like a natural diamond and has been gaining in popularity worldwide since its introduction to the fine jewelry market in 1998. Unlike Cubic Zirconia and other lab created diamonds, "moi jewelry" (as it is sometimes called) is virtually undetectable - to the untrained eye. Moissanites' physical properties and diamond clarity are so close to diamond that most diamond testers, used in the jewelry industry to distinguish lab created diamonds, will nearly always misidentify Moissanite as diamond. This is why it's so important to buy a special diamond moissanite tester. Moissanite jewelry is causing such a storm because Moissanite diamond, is Much more affordable than genuine diamond jewelry and most people would never know the difference. And talk about refracting rainbow colors! You can buy Moissanite Diamond engagement rings online for one-tenth the price of comparable diamond engagement jewelry. Bride-on-a-budget and want the dazzle of "a diamond is forever" without paying dazzling diamond prices? Or you don't want to risk wearing high-priced gemstones for every day wear? 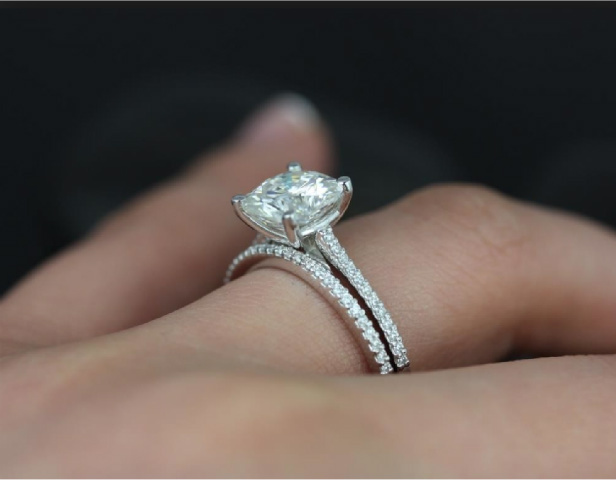 Then a lab created Moissanite engagement ring may be the perfect alternative. For More Technical Information About Moissanite, the Savvy Diamond Imitation Click HERE.